As a young man, I remember the incredible feeling of elation when I was given my first rod and reel for Christmas. It was if a light from heaven had suddenly beamed down on me, and in the hail of shredded wrapping paper that fell like snow beneath my feet, my destiny was revealed. In my hand lay the key to unlimited action and excitement. The monsters that roam the sea and prowl the depths of the pond at the end of our cul-de-sac would be brought to heel at the end of my line, following epic battles of stamina and will. Flushed with expectation, I was marched down to the pond, the land of plenty, where I would begin my reign of dominance. As my father tied on a Mepps lure, I felt a rush of adrenaline run through me. Primed for battle, I readied my stance and clenched my teeth, sure signs of innate instinct and ability. My father leaned over, passed the rod, and to complete the symbolic gesture, offered the following pre-battle advice in hushed tones: "Jon, don't expect much, now. Don't forget, this is fishing...not catching. You gotta be patient." Needless to say, I reacted like a guy on the first night of his honeymoon when his wife tells him she's must go home to mommy by midnight. Since then, I've never really bought into the whole patience thing. One of these days, I might develop the ability to take fruitless days of fishing in stride. 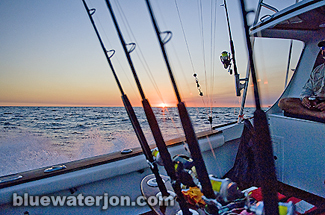 In the meantime, I'll continue to use my insatiable desire for full throttle fishing adventures as a tool, and follow my nose to where the action is at its apex. 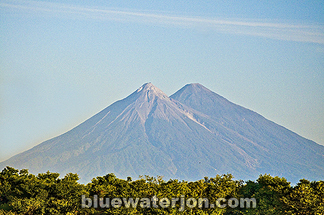 Enter Guatemala! 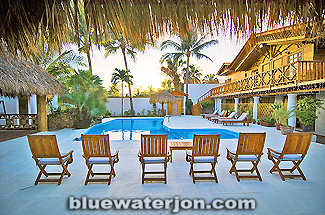 For years, I'd heard that this coffee-rich Central American country just South of Mexico was ground zero for the world's hottest sailfish action. 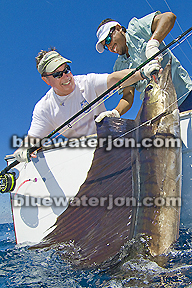 However, the numbers of sailfish releases that I'd seen reported were so high (15 to 20 or more per day, sometimes way more in the peak season) that I'd always given the reports about as much credence as the emails I get from Nigeria telling me I'm due a couple of million. Recently, though, my fascination for all things fishing has taken an unexpected turn. I've been bitten by the shutter bug, and I'm thoroughly obsessed with a new form of fishing. Instead of seeking to catch them on hook and line, I've taken to the joy of capturing them on film. In many ways, my new passion brought forth many of the same signs of fixation as my angling. 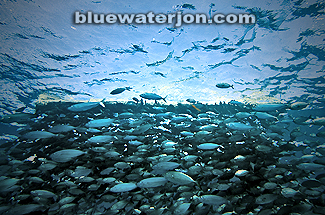 I still craved interactions with fish, and in fact, by jumping in with an underwater camera and photographing the fish as they swam near the boat, the immediacy of my interactions with the fish had only increased. Yet one thing had changed: when I saw a photo of a huge fish on the end of a line, it wasn't about which reel was used to catch the lunker- it was now about camera selection, shot composition, and positioning. I was hooked! 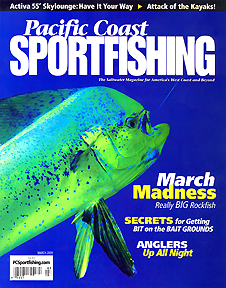 When the editors of Pacific Coast Sport Fishing and Western Outdoors chose to put my photographs on their covers, I felt a sense of great satisfaction. One common thread popped up in my research: many of the best shots had been taken in Guatemala. I'm not the sharpest tool in the shed, but I had enough smarts left to put that together with the stuff I'd heard about Guatemala years ago, and soon enough, I'm looking into places to stay. 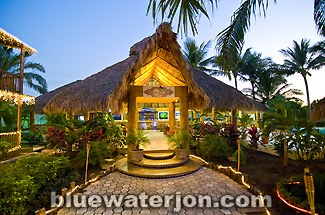 Word had it that I'd do myself a favor by looking into Casa Vieja Lodge, so I called the owner, Jim Turner, and he referred me to Al Schaefer and Herb Rosell of South Fishing, Inc, who do their booking. I could tell the place was first class. Mind you, I'm not, but my parents are, and it sounded and looked like a resort that even they would be happy at; too bad they like horses, Vermont, and opera. 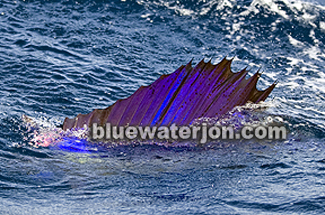 My main concern wasn't the quality of accommodations; it was staying long enough to get enough epic shots of sailfish doing their thing. "Herb, how long you think I need for that? I mean, I want to see a million of them. I wanna leave with enough images for a lifetime." "Jon, you could get that in one day here!" "Well, suppose the fishing's off, or, like, something goes wrong? Let's plan for the worst and hope for the best." "Jon, look. The worst day I've heard of anyone having in December was 12 sails. Since 1994 the fleet has averaged raising at least 20 bills a day per boat year round!" "Alright then, then gimme the last week in December." 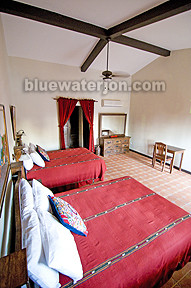 "No can do, we only have space for you for 4 nights. 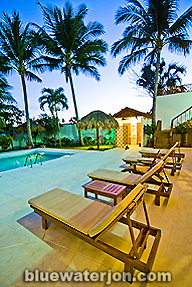 That'll be more than enough- trust me.."
Fast forward a couple weeks, Michael the driver picks me up at the airport in Guatemala City in a Casa Vieja Lodge Mercedes van and we make the 90 minute drive to the lodge, passing through the capitol. The place was way more sophisticated looking than I had imagined it- I mean, I'm thinking, huts and stuff, and instead there are plush hotels and all that dotting the city streets- think Waldorff Astoria, that kinda plush. Surprised the heck outta me. We stopped for coffee at some random café, and it was very European-looking: smart looking people sipping expensive coffee drinks, looking at fashion mags, and chatting on Iphones. So much for the Third World! I get to the Lodge and have dinner with a fellow named Ric Weider and his two daughters, Madison and Hunter. Look, I'm sorry if this sounds like a puff piece but this place was sweet! The shrimp were as big as my hand and they were so good I ate them whole, like a soft shelled crab. My dinner companions and I got along so well that even though I was scheduled to go out with another angler and his two sons the next day, I opted for Ric instead. We met Captain Nico and crew the next morning at 7:00 am at the docks, where he welcomed us aboard the Release, a 37 foot Merritt built in 1961 built by Merrit himself. It had one of those classy teak cockpits, real hardwood paneling, and mahogany girders, all shined to a mirror finish, throughout the vessel. Classy. 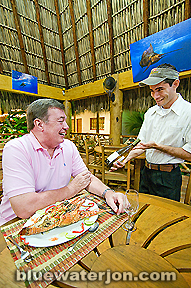 For a guy who'd released over 15,000 sails in his career (one of several captains at Casa Vieja that shared that distinction, including the famed Ron Hamlin, who has released over 28,000) Nico was a pretty unassuming fellow. On the way out of the harbor, I noticed a trio of volcanoes in the distance, the Fred Flintstone, pointy type, real volcanoes! I figured they were inactive, but about ten minutes into our trip- halfway out to the fishing grounds- one of them lazily puffed out a willowy cloud of ash into the sky, resembling a Disneyland theme park display. As Ric's girls roared with approval, the mate informed me that it was an almost daily event that's been occurring for centuries. 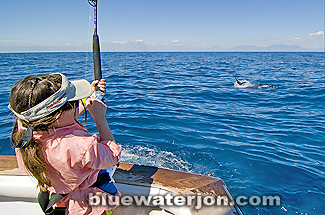 Billfishing in Guatemala is a very visual sport. Fish are raised by a spread of artificial teasers and ballyhoos, and once spotted by the captain from his perch (Left Teaser! Right Outrigger!) 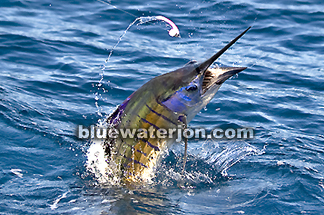 the mates draw the fish closer to the boat by reeling in the lures. 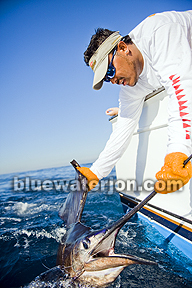 Clients have the choice of dropping a bait back to the raised, finning fish. The usual offering is a circle hook rigged ballyhoo. 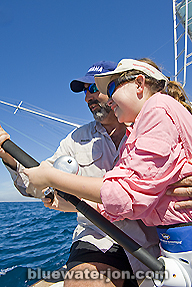 You can have the mates do it, but most anglers opt for the hands-on approach. Those new to the sport often appreciate a bit of help at first, and by the second day, they usually have the hang of it. Ric was getting his girls all pumped up for the action. Madison, the youngest daughter, had regaled me with tales of the first pig that she'd bagged hunting just months earlier, and just as I was readying my long lens for shooting, the first dorsal appeared in the spread. Before I could finish prepping my gear (Doh!) 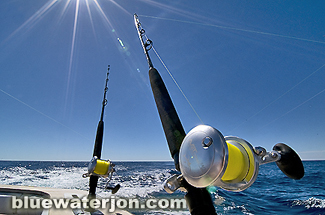 the mates teased the fish within a stones' throw of the transom. Ric picked up one of the boats' rods, set up with a shiny new Avet and a fresh spool of 20 # line, and tossed a bait in front of the fully lit-up billfish. 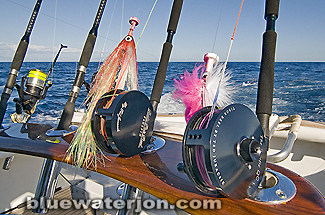 The slap of the ballyhoo on the water elicited a savage strike, and the reel sang the sweet song of the trip's first hookup. 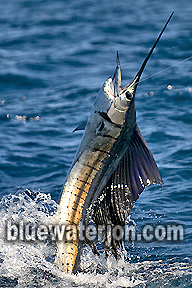 The sailfish erupted skyward, leaving a trail of salty spray in its wake. 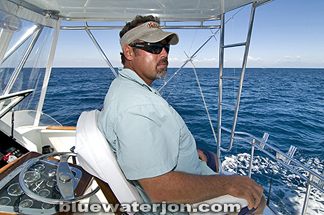 Like a true pro, I watch with mouth agape, camera lamely dangling from my neck, arms flush against my sides, as the fish proceeded to tail walk around the transom of the boat. Bozo the clown would have scored a dozen magazine covers with one hand behind his back, but somehow I failed to fire a single shot during that incredible display! 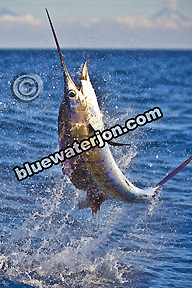 Meanwhile, Ric, having wrongly assumed I had at least the competence of a baboon, calls out to me while still fighting the fish: "Did ya get all that Jon? I bet you got some great shots there!" "Well then get in there are take some underwater pics with that camera of yours! Get your *&^ in gear!" Not wanting to look like a complete doofus, I donned my swim fins, dove in with my new housing, and my own special Guatemalan adventure began. All the clumsiness I felt on deck vanished as I felt the clear warm water envelop me. Scanning the sun streaked blue depths, I made out the figure of a lone fish swimming slowly at the end of a line. That's him! I thought, and as I began to kick my fins, the distance between us gradually closed. The majestic fish kept a wary eye on me the whole time, but nothing but great pics ever came of this encounter and the ones to follow. 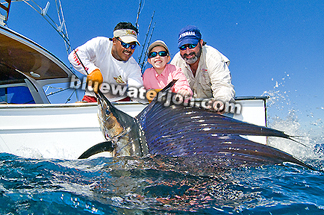 By the time we called it a day at 3:30, Ric and his ladies had landed and released 29 sailfish, and I had more pics than I knew what to do with. Herb was right! 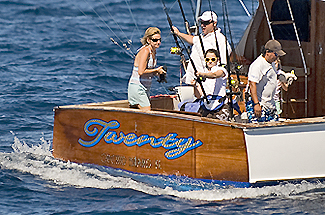 With such a great abundance of fish, people find new ways to challenge themselves and push the envelope. 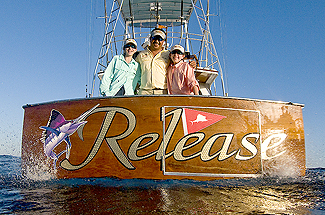 Half of the clients were repeat offenders; in fact, one of them has been there 8 times in the past 2 years, and out of these, a fair number were fly fishing for billfish. Not just sails though. 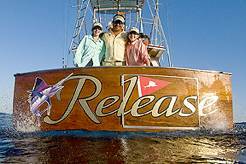 Nat Harris from North Carolina, and Kirk Weisman of Miami were there not only to try and beat the record of 57 billfish in one day, set by owner Jim Turner, but to land the elusive blue marlin on a fly as well. 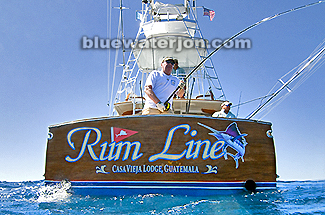 (Perhaps not too elusive- Weisman managed a 200 pounder on a fly the day before I left on one of Casa Vieja's 5 other boats, the Rum Line, captained by Chris Sheeder). They've got fly-fishing for bills down to a science there, and watching the choreography unfold as the fish are coaxed into accepting a fly not 15 yards from the transom after the captain bellows "CAAAAST!" is truly an awesome sight to behold. 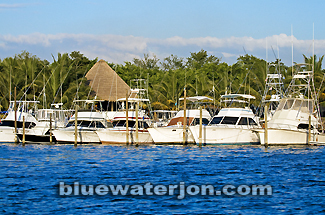 The final day of my trip, I accompanied a charter on the boat. After another day of nonstop action, we headed home, and for the second time is an as many days, came across a log loaded with dorado- big ones. 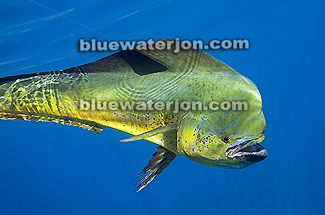 While the anglers on board pitched baits to the throngs of golden-hued bulls, I donned my fins and mask one last time, capturing these majestic animals in their own element, and we enjoyed some fresh mahi sushi on the ride home as the sun began to set over the horizon. 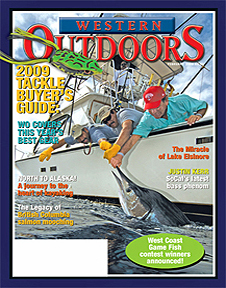 About the author: Bluewater Jon Schwartz (www.bluewaterjon.com) contributes articles and photos to fishing magazines worldwide. 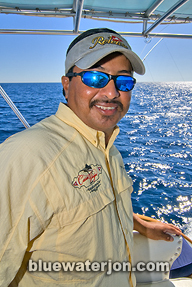 He was featured on National Geographic TV's Hooked: Monster Fish. 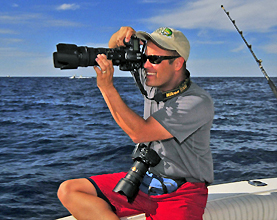 He enjoys all aspects of fishing travel, including topwater and underwater photography, video production, and public relations. 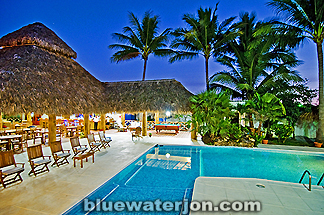 His recent assignments have included trips to Guatemala, Costa Rica, Panama, The Amazon, Cabo, and Kona. He lives in San Diego with his wife and three children, and teaches elementary school.